Fast Food News: Steak 'n Shake 7x7 Steakburger. Yes, It's Real! Steak 'n Shake 7x7 Steakburger. Yes, It's Real! There it is. Right off their website. 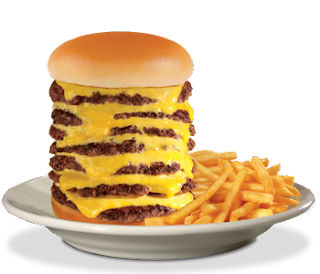 The Steak 'n Shake 7x7 Steakburger. Those 3x3's got nuthin' on this! 1570 Calories, 980 Calories from Fat. Total Fat: 109 grams. 168% of daily value. Sodium 4570 mg. 190% of daily value.